"We begin from America, where Allah has enabled brother Omar Mateen, one of the soldiers of the Caliphate in America, to carry out a raid where he was able to infiltrate a Crusaders' gathering at a gay night club in Orlando, Florida. Allah enabled him to inflict heavy casualties amongst the filthy Crusaders. He killed and injured over a hundred of them. This is the biggest raid to be carried in America after the raid of Manhattan 16 years ago. All praise to Allah." ISIS has in the past claimed responsibility for attacks that did not originate within its command structure or territory, and analysts say this latest claim still does not prove ISIS was directly involved in the shooting. The top Democrat on the House Intelligence Committee says it's possible the suspected Orlando, Florida shooter was self-radicalized but not "under the command and control of ISIS." Congressman Adam Schiff says he's been briefed multiple times by federal law enforcement about Omar Mateen, who opened fire early Sunday on a gay club, killing at least 50 people and wounding another 53. Officials say Mateen called 911 from the nightclub and expressed allegiance to an ISIS leader. Authorities have added five more names to the list of the deceased, bringing the total identified to 15. Harry Potter author J.K. Rowling tweeted early Monday morning that one of the victims, Luis S. Vielma, worked on the Harry Potter ride at Universal. "He was 22 years old," she wrote. "I can't stop crying." Among the deceased is Eddie Jamoldroy Justice, 30. He was previously declared missing by his mother, Mina Justice, who received text message from her son inside the club saying he was going to die. More on Mina and Eddie Justice can be found here. Two more names have been added to the list of deceased victims by the City of Orlando, bringing the total of the 50 identified to 10. Across the United States, people are gathering at vigils honoring the victims of a shooting attack at a gay nightclub in Orlando that left 50 people dead and 53 wounded. Host James Corden opened Broadway's biggest night with a message for the fallen in Orlando. "Our hearts go out to all of those affected by this atrocity. All we can say is you're not on your own right now. Your tragedy is our tragedy," he said in part, adding: "Hate will never win. Together we have to make sure of that. Tonight's show stands as a symbol and a celebration of that principle. This is the Tony Awards." A GoFundMe page setup for the victims of the Orlando mass shooting has now surpassed $1 million in donations. The fund, set up by Equality Florida, has had more than 25,000 donors since the shooting happened. She says that in the four months they were together he cut her off from her family and regularly beat her. She says that her family visited her and saw she wasn't OK and rescued her from the situation. Yusifiy says they literally pulled her out of his arms. She says she left all her belongings and has had no contact with him for seven or eight years. Of the nightclub massacre she says, "there was no sign of any of this at all." The bodies were then taken to the Orange County Medical Examiner's office. The top Democrat on the House Intelligence Committee tells The Associated Press that investigators have not yet found evidence of direct communication between the Orlando nightclub gunman and Islamic State or Iraq and Syria (ISIS) members overseas. Rep. Adam Schiff has been briefed multiple times by federal law enforcement. He says it is possible that Omar Mateen was self-radicalized but not "under the command and control of ISIS." The California congressman says that could change and that it's too early to know whether there was something that could have been done to prevent the attack. The FBI investigated Mateen in 2013 after he made inflammatory comments to co-workers alleging possible ties to terrorists. The following year, the agency looked into potential ties connecting Mateen to Moner Mohammad Abusalha, the first American to carry out a suicide attack in Syria. He was cleared after both investigations. Vice President Joe Biden released a statement Sunday evening in regards to the mass shooting, calling it "an act of pure hate and unspeakable terror." "They were our brothers and our sisters; our friends, neighbors, and loved ones. In the coming days, we will learn more about these fifty souls and the lives they lived and the world they made better," Biden said. "The violence is not normal, and the targeting of our lesbian, gay, bisexual, and transgender Americans is evil and abhorrent," Biden said. Seattle's openly gay Mayor Ed Murray says that every time progress is made in the U.S., there's a blow back and an increase in gay lesbian bisexual transgender violence. Murray made the remarks Sunday after a gunman slaughtered 50 people in a gay nightclub in Orlando. Murray says the massacre is absolutely an attempt at intimidation and fear. He says the community will come together and will not be intimidated. The City of Orlando has added a seventh person to their list of the deceased: Luis S. Vielma, 22 years old. CBS affiliate WFOR tweeted video from Orlando resident David Ward. The video reportedly captures the moment SWAT teams shoots and kills the suspected gunman in the Orlando mass shooting. A woman whose cousin was shot at a gay Orlando nightclub says he is in critical condition at a hospital. LaToya Hall says her cousin Keon Carter was in the Pulse club early Sunday when a gunman opened fire and killed 50 people and wounded about 50 others. Hall says her cousin is alert at Orlando Regional Medical Center. She says he tried to hold her hand and turn his eyes to look at her. Hall says many people are having trouble locating victims because they are being listed under fake names. The City of Orlando is asking for a hold on vigils being planned in the city. In a tweet, the city asked that vigils be put on hold because of the strain it puts on its limited resources, which need to be dedicated to the victims and their families. A U.S. intel source tells CBS News that Mateen called 911 during the shooting from the bathroom. They called him back and that is when he pledged alliance to ISIS and al Baghdadi. The source says he made two foreign trips, one in 2011 to Dubai and one to Saudi Arabia in 2012. He was not on a current watch list. He was on the Terrorist Screening database when the FBI was questioning him. Source tells CBS News he was removed when the FBI closed their investigation. The 2013 investigation began when Mateen told co-workers and others he knew the Tsarnaev brothers. The ATF tweeted a photo of two guns, saying the guns were similar to those traced to the Orlando shooting. "Guns traced in #Orlando shooting: .223 caliber AR type rifle and 9mm semiautomatic pistol. Similar to those pictured," the tweet read. The City of Orlando has released names of victims of the nightclub shooting whose next of kin have been contacted. The list will be periodically updated on www.cityoforlando.net/blog/victims/ as those who died are identified and families and loved ones notified. The city gave no additional information other than the names. American Muslim leaders are condemning the attack on a gay nightclub in Orlando that killed 50 people and wounded more than 50 others. A law enforcement official has said the gunman, Omar Mateen, called 911 from the nightclub and expressed allegiance to an Islamic State leader. Awad says members of the LGBT community have stood with Muslims in the past and today they stand that community. Omar Mateen's ex-wife told The Washington Post that she met him online about eight years ago and decided to move to Florida and marry him. The ex-wife, who wasn't named in the report, says at first the marriage was normal, but then he became abusive. They were together for only a few months and her parents intervened when they learned Mateen had assaulted her. She says he wasn't very religious and gave no signs of radical Islam. She said he owned a small-caliber handgun and worked as a guard at a nearby facility for juvenile delinquents. Mateen's ex-wife said his family was from Afghanistan, but her ex-husband was born in New York. His family later moved to Florida. Mateen legally purchased in the last few days the two guns he allegedly used to kill 50, and wound 53 more at a gay night club in Orlando, authorities said Sunday. The FBI confirmed at a press conference Sunday afternoon that federal authorities twice looked into Mateen in the past. In 2013 Mateen allegedly made inflammatory statements referencing terrorism while talking to coworkers, and in 2014 he was questioned because of what FBI Special Agent Ron Hopper called a possible connection to a suicide bomber. State records show suspected shooter Mateen held the firearms license since at least 2011. It was set to expire in September 2017. It wasn't immediately clear where, if anywhere, Mateen had worked as a security officer. An armed guard license in Florida requires 28 hours of classroom training by a licensed instructor. The terror group ISIS has claimed responsibility for the attack Sunday morning at a gay nightclub, which left 50 dead and 53 injured, according to the latest estimates from authorities. The group's Amaq Agency quoted a source in claiming that the shooting "was carried out by an Islamic State fighter." Speaking from the White House, Obama says the United States has to decide if that is the "country we want to be." He says that doing nothing is a decision as well. A law enforcement official has confirmed to CBS news senior investigative producer Pat Milton that shooting suspect Mateen made the Hajj, an Islamic pilgrimage to Mecca, Saudi Arabia in March 2012. President Barack Obama said at a press conference Sunday that the shooting was an "act of terror" and an "act of hate." He said the FBI is investigating it as an act of terrorism and that no effort will be spared to determine whether the shooter was affiliated with terrorist groups. Staff at the Islamic Center, a mosque in Ft. Pierce, Florida, confirmed to CBS News that Mateen, 29, has worshiped at the facility regularly for several years. We condemn this monstrous attack and offer our heartfelt condolences to the families and loved ones of all those killed or injured. The Muslim community of Fort Pierce joins our fellow Americans in repudiating anyone or any group that would claim to justify or excuse such an appalling act of violence. A law enforcement official confirmed to Milton that Mateen called 911 and declared his allegiance to ISIS. He identified himself to the 911 operator giving his full name, according to the source. He also mentioned the Tsarnaev brothers, the men who ignited explosives at the 2013 Boston Marathon. Although some Twitter accounts linked to the terror group ISIS have described Mateen as a hero, the group has not claimed responsibility for the attack. Members of Congress have been told by authorities that Mateen appears to have made some sort of pledge of allegiance to ISIS, reports CBS News Correspondent Jeff Pegues. A law enforcement source tells Milton that investigators are seeking search warrants for Mateen's residence, car, and communication devices, including his cell phone and computer. They are also seeking his financial and phone records to determine who Mateen has been in contact with, and in particular if he was communicating with anyone overseas. Souces tell CBS News that suspect Mateen was on law enforcement radar during the last five years, but no formal investigation was opened. Mateen, who has worked previously as a security guard, was not under investigation at the time of the shooting. What next for law enforcement officials in Orlando mass shooting? A SWAT truck and a bomb disposal unit are on the scene of an address associated with Mateen, who is suspected of killing 50 and wounding 53, at a gay nightclub in Orlando early Sunday. There is a media staging area set up about a block away from the apartment complex in a residential neighborhood in Fort Pierce, Florida, on Sunday. CBS News has confirmed that the photo above is of Mateen, the man who authorities believe killed 50 and wounded 53 early Sunday, in a mass shooting at Pulse, a gay night club in Orlando. Mir Seddique, of Port St. Lucie, Florida told media that his son got angry when he saw two men kissing in Miami a couple of months ago and thinks that may be related to the shooting. Seddique says: "We are saying we are apologizing for the whole incident. ... We are in shock like the whole country." Officials say the shooter was among the 50 killed, and that they're investigating whether the incident was an act of terrorism. The leaders of The American Muslim Community Centers, a mosque in Longwood, Florida, near Orlando, released a statement condemning the attack, which left 50 people dead and 53 injured early Sunday at Pulse a gay club, according to police . Is Orlando mass shooting linked to Islamic terrorism? Evans says, "It sounded like fireworks - pop, pop, pop - and then everybody scatters." Jackie Smith was inside the club and says two friends next to her were shot. She says she hasn't gotten updates on their conditions. She came out of the hospital and burst into tears in the arms of friends. She says: "Some guy walked in and started shooting everybody. He had an automatic rifle, so nobody stood a chance. I just tried to get out of there." Officials at the news conference also say they have securing the suspect's vehicle, a van, right outside the club. The shooter has been identified as Mateen of Port St. Lucie, Florida. Officials have said they're investigating whether the massacre was an act of terrorism. He tells The Associated Press, "I think we will see the death toll rise." Earlier, U.S. Rep. Alan Grayson identified the shooter as Mateen, of Port St. Lucie, Florida. He cited law enforcement officials in speaking to reporters. Officials also have said they're investigating whether the incident was an act of terrorism. "There's blood everywhere," Mayor Buddy Dyer said Sunday at a news conference, hours after the shooting. 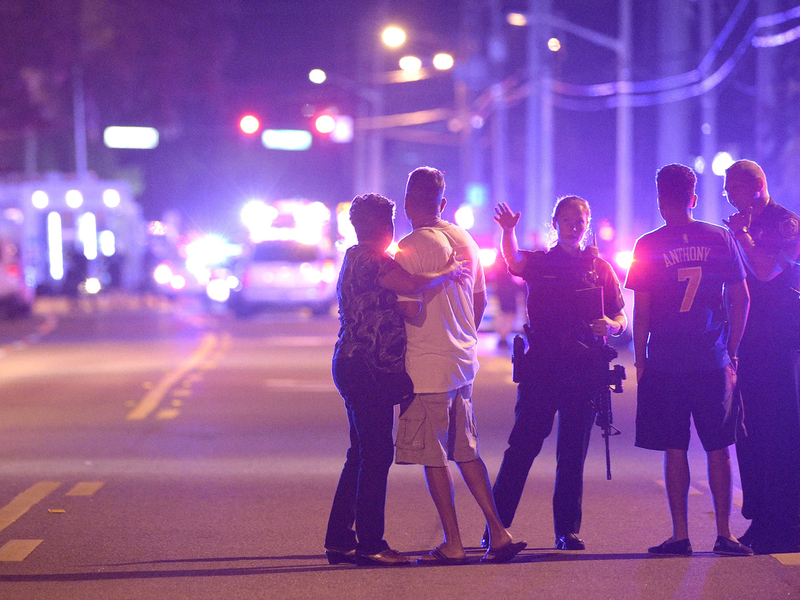 Orlando shooting victim describes aftermath: "This is a nightmare"
Earlier, U.S. Rep. Alan Grayson identified the shooter as Mateen of Port St. Lucie, Florida. He cited law enforcement officials in speaking to reporters. The suspect in the mass shooting at night club in Florida has been identified as Mateen of Port St. Lucie, Florida. - Eric Tucker in Washington contributed. Florida's governor is headed to Orlando after a shooting at a gay nightclub there left about 20 dead and 42 wounded. The statement says he'll meet with law enforcement and local officials in Orlando. Press secretary Josh Earnest said in a statement that the president has directed federal officials to provide "any necessary assistance to pursue the investigation and support the community." Mina says the shooter was armed with an assault-type rifle, a handgun and some type of suspicious device. Police had said previously on Twitter that there was a "controlled explosion" at the scene of the shooting at Pulse Orlando, a popular gay dance club. Mina says that noise was caused by a device intended to distract the shooter. Orlando Police Chief John Mina did not immediately provide an exact number of how many people were killed. Police had said previously that the shooting was a "mass casualty situation." Mina says the shooter was armed with an assault-type rifle, a handgun and some type of device. Police had said previously on Twitter that there was a "controlled explosion" at the scene of the shooting at Pulse Orlando. Orlando Police did not immediately provide further details on the department's official Twitter account on Sunday. It was not immediately clear how the shooter died. Police described the shooting as a "mass casualty situation" and said local, state and federal agencies were involved in the investigation. It was not immediately clear how many people were wounded in the shooting, or if any of the victims had died. Police have told people to stay away from the area and said a noise in the vicinity was a "controlled explosion." No further details were provided on the explosion. The club, Pulse Orlando, earlier posted on its own Facebook page just after 2 a.m.: "Everyone get out of pulse and keep running." Police say a loud noise near the scene of a reported shooting at a nightclub in Florida was a "controlled explosion." Orlando Police said on the department's official Twitter account Sunday that media should avoid "reporting inaccuracies." No further details were immediately provided about the explosion. Police have said "multiple injuries" were reported following the incident at the Pulse Orlando nightclub near Orange and Kaley avenue. The department also advised people to stay away from area. Multiple emergency vehicles have reportedly responded, including the Orlando Fire Department's bomb squad and hazardous material team. Pulse Orlando earlier posted on its own Facebook page just after 2 a.m.: "Everyone get out of pulse and keep running." A post on the department's official Twitter account early Sunday morning says "multiple injuries" have been reported following the incident at the Pulse Orlando nightclub near Orange and Kaley avenue. The department also advises people to stay away from area. Pulse Orlando earlier posted on its own Facebook page: "Everyone get out of pulse and keep running." The incident follows the fatal shooting on Friday of 22-year-old singer Christina Grimmie, who was killed after her concert in Orlando by a 27-year-old Florida man who later killed himself. Grimmie was a YouTube sensation and former contestant on "The Voice."